You can use sandpaper to transfer crayon onto fabric. Who knew!? Let the kids draw their own design onto fine sandpaper and then transfer it onto a t-shirt or any other cotton fabric (pillows cases, totes, socks, etc.) with an iron. Go get the full instructions here. With spring right around the corner, the kids are going to be itching to get outdoors. I’m not a play-in-the-mud type of gal, but THIS I can handle! 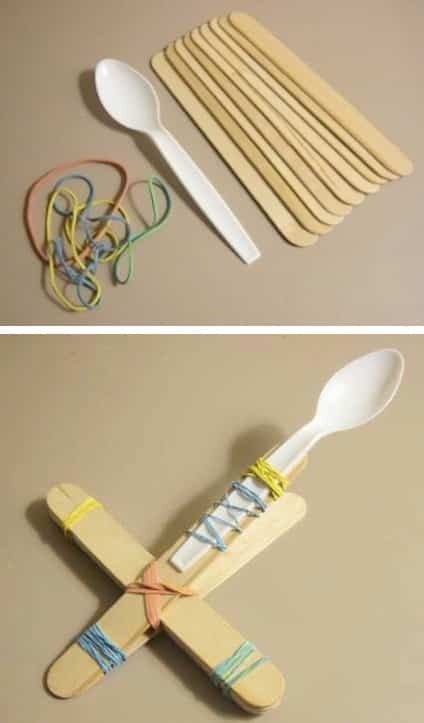 You can really use your imagination with items you can find in the yard and craft closet! The craft stick house is a cute little touch, too, don’t you think? You could even paint or add designs to the sticks first. Go get the instructions and see more photos here.